PCNT welcomes our guest speaker for our November networking event; Dr Allan Hawke. 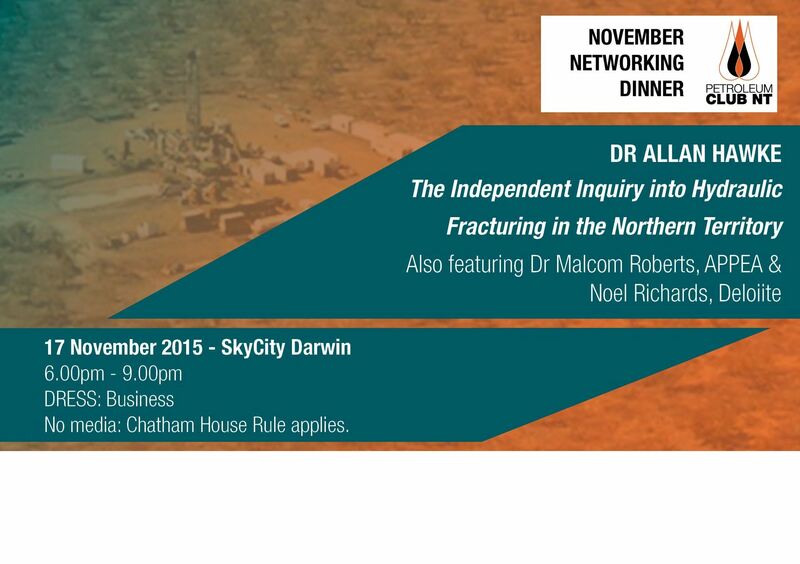 The event will focus on "The Independent Inquiry into Hydraulic Fracturing in the Northern Territory" submitted by Dr Hawke late last year. The report was released by the NT government on 26 February 2015 and is available for download through the following link: Report of the Inquiry into Hydraulic Fracturing in the Northern Territory. Dr Hawke will address the recommendations arising from his review and subsequent developments. We also have 2 supporting speakers at this event with Dr Malcolm Roberts, CEO APPEA and Noel Richards, Associate Director Deloitte. Dr Roberts will share APPEA's views and research into onshore development in NT while Noel will focus on the DAE report recently produced for APPEA highlighting the potential of significant long-term economic benefits for the NT. More information on our speakers available here. Don't miss out on this opportunity to hear experts within the oil and gas industry present on such a relevant topic for our industry in NT. Event bookings are now open online - All tickets include 3 course meal, beer, wine and soft drinks.